Raabe Ford dealership in Delphos. Stay focused: A company called NVIDIA is using artificial intelligence and cameras to sense where a driver is looking and focus sensors everywhere else. If a pedestrian or another vehicle appears where the driver isn’t looking, the system will intervene, either sounding a warning or by stopping the car from moving, says Danny Shapiro, senior director of automotive business for the Santa Clara, California, company. “Before we get to full automation, if the driver is still in control and responsible, we want to know when we should provide alerts and when we should not,” Shapiro says. NVIDIA has a contract with Volkswagen to deploy the system in the next two years. Other automakers are likely to follow. Looking backward: When a driver activates a turn signal, an 8-inch screen behind the steering wheel on Hyundai’s new Nexo hydrogen fuel cell vehicle shows everything on that side of the car plus what’s directly behind it. The system uses existing cameras to let drivers see without turning their heads. “The information we can offer from a camera may be better than a live look over the shoulder,” says Cason Grover, senior manager of vehicle technology planning for Hyundai. Other cars have similar technology but most don’t have as wide of a view. Seeing signs: Mercedes’ new S-Class cars have advanced navigation and global mapping, and cameras that read speed limit signs. These enable the car’s computers to warn drivers of the speed limit or keep them from exceeding it. The system also recognizes upcoming construction zones, curves or roundabouts, and can slow the car ahead of when a driver would. LIMA — More than 20,000 new cars have been sold in Allen County over the past three years, and 1,223 of those new cars have already been sold in 2018, according to data compiled by the Allen County Title Department. From 2015 to 2017, the number of cars sold in Allen County has been constant, averaging a little over 5,000 cars a year and generating over $700,000 in sales. According to Lima Auto Mall General Sales Manager Ryan Swaney, the highest peak season for selling new cars is from December to May as kids go back to school and people begin searching for cars for vacation. Buyers are finding many advanced electronic safety features in new vehicles. Many of the new features repurpose cameras and radar that already are in cars for automatic emergency braking, pedestrian detection and other safety devices. Other incentives for buying new cars over used is that customers can receive a 3-year, 36,000 miles, bumper to bumper warranty, a free factory warranty and a 5-year 60,000 powertrain warranty, according to Raabe Ford Sales Consultant John Thomas. Along with discounts for military personnel, veterans, first responders, college grads and students, it’s worth getting a new car, according to Thomas. Some of the newest and most popular Chevrolet models of 2018 are the Silverado, the Trax, the Equinox and the Spark, according to Swaney. The 2018 Silverado is a popular truck because of its reliability over the past 100 years and has ultimately turned into a family car, according to Swaney. The starting price is $28,285 and has 18 miles per gallon for city driving and 24 miles per gallon on the highway. The 2018 Trax is a popular midsize SUV, with 33 MPG on the highway, all wheel drive starting at $21,000. It is a car for all ages from 16-year-olds to 80-year-olds, according to Swaney. The 2018 Equinox, a mid-size SUV is the number one sell on the Lima Auto Mall car site, according to Swaney. The SUV starts at $23,580 and has 39 mpg on the highway, 4G LTE Wi-fi, and much more. According to Swaney, the Chevy Spark is a price-point vehicle, priced at approximately $16,800 before the rebate. It has 38 mpg on the highway as well as in the city. 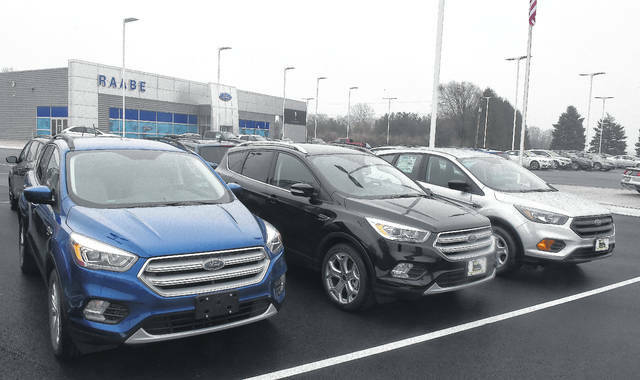 The most popular Ford models sold at Raabe Motor Sales dealership in Delphos are the Escape, the F-150 and the Fusion, according to Thomas. The 2018 Ford F1-50 has been the number one selling truck for 36 years in a row, according to Thomas. The starting price for the truck is $27,705 with 18 mpg on the city and 24 mpg on the highway. The 2018 Ford Escape is a mid-size SUV tailored at the hip level which allows the driver to slide in and out of the vehicle with ease, according to Thomas. The starting price for the Escape is $23,940 and has 21 mpg in the city and 29 mpg on the highway. The 2018 Ford Fusion is a mid-size car with 32 mpg on the the highway and 21 mpg in the city, according to Thomas.